An electromagnetic field meter displays electromagnetic wave measurements in volts (V), milliVolts (mV), Watts (W), milliWatts (mW), Gauss (G), milliGauss (mG), milliTesla (mT), microTesla (µT) or nanoTesla (nT) units. An electromagnetic field meter can detect either static (DC) permanent (rare-earth) magnetic or dynamic (AC) electromagnetic fields (EMFs), or both. Thus, it is important to review the specifications of an electromagnetic field meter prior to purchase to ensure suitability for the intended application. Neodymium (NdFeB) permanent magnets are among the world's strongest and most widely used magnets. When testing magnets made of neodymium or other rare-earth elements, an EMF meter, gaussmeter or magnetometer capable of measuring DC magnetic fields is required. 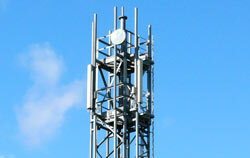 However, most electromagnetic fields encountered are generated by AC currents. Examples include electrical power lines, transformers and wiring for overhead lighting, solar panels and other electrical devices and equipment. Electromagnetic fields from electrical installations are believed to cause feelings of nervousness, anxiety and paranoia in EMF-sensitive human beings. 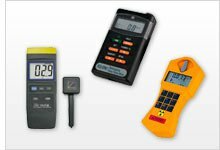 Each EMF meter offered by PCE Instruments can be calibrated and certified according to DIN ISO 9000 standards for an additional fee. Replacement EMF meter probes and optional accessories are available for most EMF meter models. If you have any questions about the electromagnetic field meter products found on this website, please contact us at or +44 (0) 2380 987 035 for PCE Instruments UK, or at or +1 (561) 320-9162 for PCE Americas Inc.
PCE-EMF 823 is a portable handheld single-axis electromagnetic field meter or Gauss meter for measuring electromagnetic fields (EMFs). This user-friendly EMF meter is ideal for assessing risks associated with exposure to electromagnetic radiation emitted from electric power lines, home appliances and industrial devices. PCE-EM 29 is a portable handheld electromagnetic field meter or detector with a spherical triaxial (3-axis) three-dimensional (3D) isotropic sensor used to measure electromagnetic fields (EMFs) as well as radio frequencies (RFs). This easy-to-use battery-powered RF meter features a large 4-digit LCD screen and an adjustable value limit with acoustic alarm functionality. PCE-G28 is a portable, handheld electromagnetic field meter or gauss meter that detects electromagnetic fields (EMFs) and displays measurement results in milliGauss (mG) or microTesla (µT). This EMF radiation detector comes with an external 3-axis electromagnetic sensor (X, Y, Z direction). PCE-MFM 3000 is a handheld electromagnetic field meter or gauss meter that detects both static (DC) permanent magnet (rare earth) magnetic and dynamic (AC) electromagnetic fields (EMFs) and displays measurement results in gauss (G) or milli Tesla (mT). This portable magnetic field measuring device comes with an external sensor and features an RS-232 port for downloading data to a PC. PCE-EM 30 is a digital portable 3-axis electromagnetic field meter or EMF detector used to measure electromagnetic radiation generated by electronic devices and electric installations. This triple-axis EMF meter provides greater precision than single-axis models as well as affords the ability to assess EMFs from more than one source at a time. Electromagnetic field (EMF) has become widely popular in recent years as many individuals are showing interest in knowing just how strong an EMF field is within the home or office. There are many common electrical appliances found within the home including radios, computers, microwave ovens, telephones, and iPads where the presence of EMF fields are quite high. An electromagnetic field meter is designed to detect and characterize the strength of an emission. This ensures that safety measures are taken when limits are exceeded in order to maintain favorable conditions. The application of an electromagnetic field meter will allow you to detect the exact source of an extremely high emission, as this may otherwise be difficult to determine without any auxiliary help. Many of today’s devices are found within close range of each other, creating a dense, highly concentrated electromagnetic field. This meter will also detect sources that may be hidden within the area, helping to solve the implicit problems. The activity of the emission is dependent upon the usage of each device and because the EMF is not a stable magnitude, it may change within a short amount of time. It is important to know the strengths and levels of an EMF as this gives an indication about how safe the atmosphere is within a certain environment. Making simple changes such as moving the source of emission to another corner or enlarging the distance between the devices can have positive effects including a reduction in the value of emission. This change or reduction can be verified with the help of a electromagnetic field meter. Establishing a comfortable and healthy living environment without the potential hazards of high electromagnetic levels can be done easily and conveniently with an electromagnetic field meter. This easy to use meter is designed for new users who are not familiar with the features of EMF and its formation, but who have concerns about their well-being and having the ability to maintain a healthy living environment.